백자 상감모란문 병(白磁 象嵌牡丹文 甁)은 조선 전기에 만들어진 백자 병으로 높이 29.6㎝, 아가리 지름 7.4㎝, 밑지름 9.6㎝의 크기이다. 짧은 목에 나팔처럼 벌어진 아가리와 몸체가 풍만하고 약간 높은 굽다리를 지닌 전형적인 조선 초기의 술병이다. 목 부분에 두 줄씩의 선을 흑상감 기법으로 위·아래에 각각 두르고 그 사이에 물결모양의 덩굴무늬를 간결하게 표현하였다. 백자에 이런 흑상감기법을 사용하여 문양을 내기 시작한 것은 고려시대 청자에서부터 비롯된 것으로, 15세기에 사용되었다. 목 부분에는 유약의 색이 변색되어 검은 점들이 있으며, 굽다리에 작은 흠이 있다. 표면의 광택은 담청색을 머금은 회백색으로, 고려 상감백자 계열의 부드러운 감각이 묻어난다. 백자가 주는 부드러운 흰색의 바탕 위에 검은색을 넣어 상감한, 단순하고 큼직한 모란 모양의 장식이 풍만하고 안정감 있는 그릇 모양에 잘 어울리고 있다. 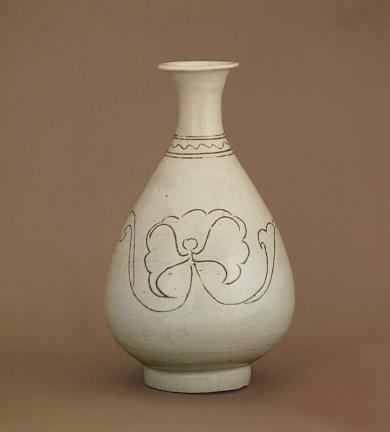 This is a white porcelain liquor bottle from the early days of the Joseon Dynasty. It is 29.4 cm high while the diameter at the mouth is 7.4 cm and that at the base is 9.6 cm. Having a short neck, a mouth spread like a trumpet, a plump body and a slightly high heel, it is a typical liquor bottle of early Joseon. There is a pair of black inlaid lines around the neck, and a simple vine design resembling a series of waves is inserted in between them. Black inlaid designs applied to white porcelain were first found in the Goryeo celadon made during the 15th century. The enamel coating around the neck area has deteriorated and black spots have appeared. In addition, there is a small crack on the heel, and also minute cracks on the surface. The gloss on the surface is gray white with a light blue tone, giving the soft feel of the white inlaid porcelain of the Goryeo Dynasty. A large, simple peony blossom decoration inlaid in black on the soft white background of the white porcelain matches well with plump, stable shape of the bottle.